From tropical South America and the Caribbean, the Cannonball Tree is also widely grown in India. It is thought that the seeds of the tree were brought to Asia many 100s of years ago. 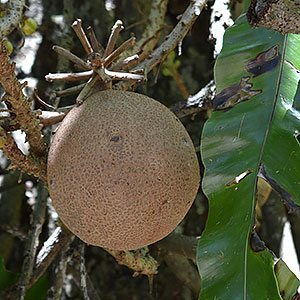 This is a tree that lives up to its name, the fruits are as large as, and as hard as cannonballs. The botanical name is Couroupita guianensis, and thins also a flowering tree, large orange to pink flowers in long racemes. It is for the woody fruit that the tree is famous. The large ‘cannonballs’ form on the trunk of the tree, forming after the flowers which also grow on the trunk. The fruit itself is inedible, the smell and taste make it so. The fruit is heavy, and the tree needs to be planted away from pathways or any area where it could fall on passers by. However as it falls close to the trunk the problem is easily over come. Although originally from the Americas, the tree has religious significance in India. It is planted near temples, where it is the flower that is revered. In Hindi the flowers are called Shivalinga, in Tamil the tree is known as the Nagalingan tree. Parts of the tree are said to have natural antiseptic and analgesic qualities. The outer shells are often cut and shaped into bowls. Propagation is from seed. In nature, when the large fruits hit the ground with a thud, they often break open. They emit a strong foul smell which attracts some animals and the seed is dispersed.